Student Ambassadors are a student organization that assists the Admissions Office with daily office tasks with semester based hours, tours for prospective students, open houses, and other Manor events. While receiving professional development training, Student Ambassadors will also be assisting with New Student Orientation in the Fall and Spring semesters. 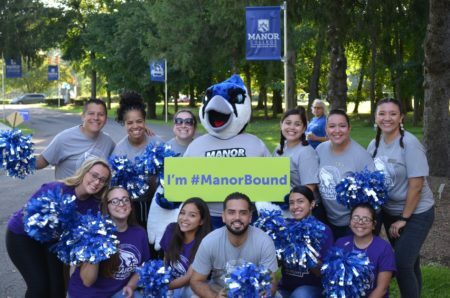 The requirements for this organization are a minimum required GPA of 2.5, an outgoing personality, and a friendly face to welcome prospective families while upholding the Catholic Mission of Manor. Interested in giving tours to perspective students, helping out at official Manor events, and being a spokesperson for Manor College? If so, sign up to be a Manor College Student Ambassador below.